I love baking and who does need a reason to bake??? well I sure have a reason today, its autumn and we have a halloween coming up at the end of this month. Needless to say that its pumpkins galore. Trust me if you are a baker and never used pumpkin in baking cakes and cupcakes, it's a must try and they give amazing moisture and texture to the cake. About the cupcakes they were not only moist but had a beautiful texture, I guess its the combination of buttermilk and pumpkin puree. Needless to say the yum factor of the cream cheese frosting now tell me who would not love it. I took up additional challenge to make the buttermilk and pumpkin puree at home, although it called for some additional work yet it was all worth it. In a baking tray line with kitchen foil. Remove the stem and cup out the pumpkin into half from top to bottom, scoop out the seeds with a spoon and the fibers too. Arrange the pumpkin with rid side down (skin facing up) and bake in a pre-heated oven for 30-40 mins. Until a fork inserted on the skin perks smooth. Remove the skin using a knife let it cool down and blend it in a food processor/ mixie jar to make a fine puree. Prepare a muffin tin with cupcake liner or just grease them with little oil/ butter, set aside. Sift the flour, cocoa, baking powder, baking soda, cinnamon, and nutmeg in a large bowl and set aside. Combine the buttermilk, pumpkin, and vanilla in a medium bowl and set aside. Beat the butter and sugar together in a large bowl, with an electric mixer set on medium speed, until fluffy. Add the eggs, one at a time, beating well after each addition, until the mixture is smooth and light. Alternately add the flour mixture and buttermilk mixture, blending well after each addition. Heat oven to 375 degrees F. Place cupcake liners in standard cupcake tins and fill each with 1/4 cup of batter using an ice cream scoop. Bake for 22 minutes.and bake until a wooden skewer inserted into the middle comes out clean -- about 35 minutes. Cool the cakes in the pan for 20 minutes. Remove cakes and cool. Blend the cream cheese ,butter, orange juice, orange zest, and vanilla in a large bowl, using an electric mixer set at medium speed, until smooth. Add the sugar and continue to beat until light and creamy -- about 3 more minutes. Cut the tops of the cupcake (if necessary), mine did not require this. Fill an icing bag with frosting and scoop it out with your own design. Store in refrigerator and serve chill. - Make sure you do not fill more than 1/4 of the cupcake case/ tin as they rise till the rim during baking. - Make sure to blend the butter and cream cheese well before adding the other ingredients and they are at room temperature. 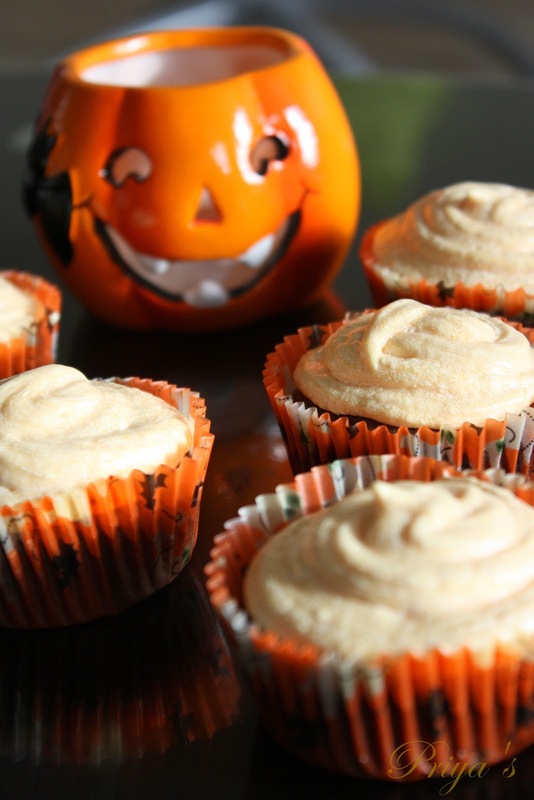 These look delicious...and they're cute - perfect for the season! Cool Cupcakes with Orange frosting, love it!!! Lovely cake.. Looks gorgeous.. Well explained..
lovely pics .......would push anyone to try the recipe :)) amazing !! 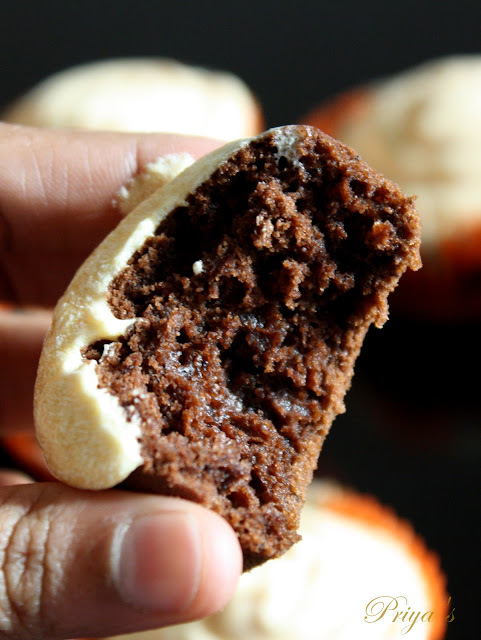 Feel like making some again, thanks for suggesting this yummy cupcakes Priya, everyone at home just enjoyed licking the frosting and having this super spongy cupcakes. Wonderfully presented delicious cupcakes Priya. Like to have few now...so yummy dear. Delicious I will try this, I got little busy. Your cupcake looks perfect and delicious . Love the click. The texture of teh muffins looks awesome!! Wud love to grab a few..The icing is one of my all time fav ones! Wonderfully festive display and delicious looking cupcakes! Looks lovely. The texture looks super spongy. Great job on your cupcakes they look delish. Love the blog write up and photos. I wanted something a little lighter. 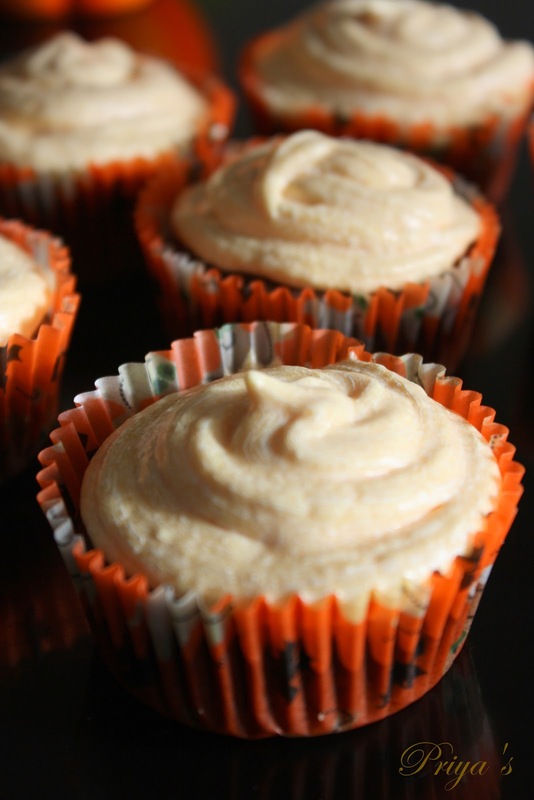 Maybe I should have made these instead of the spiced pumpkin cupcakes. Yummy cupcakes.. They look delicious.